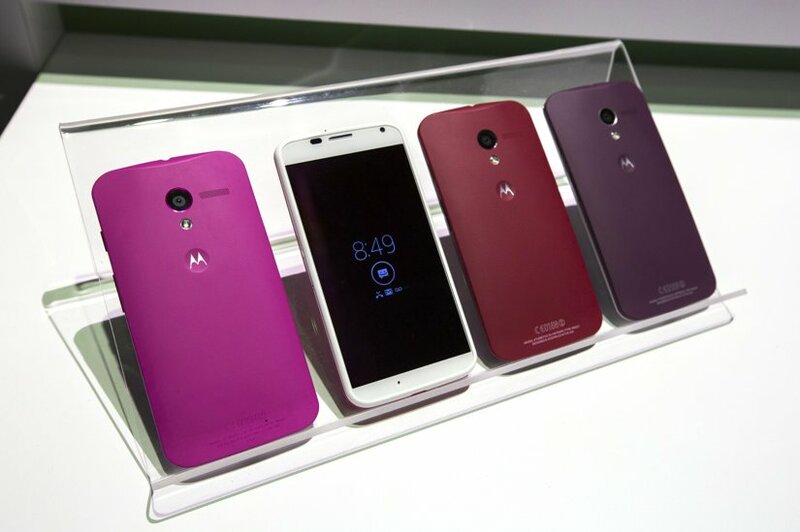 Motorola has announced Moto X, the first smartphone to be launched after Google’s acquisition. Which means naturally Moto X is gonna need a lot more than just a bang now that it is coming out with a Google tag and of course ‘first’. Moto X seems to largely rely on its features to make a mark in the smartphone market. Moto X will coming with voice control, an ultra-fast camera and the strangest color combinations you’ve ever seen on a smartphone. We are sure the last bit is going to confuse impress a lot of people. So, what else? Well according to Motorola VP of Product Management Lior Ron, the aim of the Moto X is similar to that of the stated purpose of Google Glass: to get out of the way, and to make interaction with your smartphone more human, more natural. The most gee-whiz feature of the Moto X is what Motorola calls “Touchless Control.” Also available on Motorola’s recent Droid phones for Verizon, this allows X owners to awaken and operate their smartphone without touching it. Say “OK, Google Now” and the screen unlocks, the display powers on and you are able to instruct the smartphone to complete a number of actions, among them: Making a phone call, sending a text message, searching Google (duh), getting navigation directions, changing the music, checking the weather, setting a reminder and essentially anything else Google’s Siri competitor, Google Now, can accomplish. You don’t need to be connected to Wi-Fi or the mobile network for Touchless Control to work. And to prevent pranksters from activating the assistant by saying “OK Google Now” in your vicinity, the phone learns your voice so that it only responds to you. There are some obvious flaws, of course: It would be nice if it can learn one more person’s voice (your wife’s, for example), so that someone else could borrow your phone or take control if your mouth is otherwise indisposed. And during a meeting with Motorola, the function was accidentally triggered when a Motorola exec said “OK” without the Google Now. In my brief tests with the Moto X, however, I could only get it to power on when I said “OK Google,” and none of my colleagues were able to launch my assistant by speaking the magic words. But back to Touchless Control: If anything, the great obstacle for Motorola’s voice feature is Google’s speech recognition. Though still far better than Apple’s, it still occasionally muddles words and occasionally hears speech when it shouldn’t. For this to truly be a killer feature, Google will have to continue tweaking its software until it can flawlessly recognize speech. Like HTC, Apple and Nokia, Motorola is also heavily promoting its camera. The most distinguishing feature of the Moto X is probably the speed with which you can go from locked display to captured photo; Motorola execs said in a meeting with press that the aim was to get that time down to 2 seconds, from pocket to shutter, versus times of 8 to 10 seconds with other, unnamed phones. That’s a neat gimmick, but I’m not sure how often I’d use it; and for the first few uses, it was kind of tricky to get the gesture just right. More welcome is the totally clean camera interface: All of the settings have been moved off the screen; they can be fetched by swiping in from the left of the screen, so that almost all you’re seeing when you’re shooting a photo is the scene in front of you. Zooming in and out is also neat: You just run your finger up or down anywhere on the screen to activate the digital zoom, rather than the scroll bar favored by most smartphone cameras. This is much more intuitive, and easier to use, especially with one hand. The software is neat, if occasionally uninspiring; it’s the hardware where it seems like Motorola could really pick up some customers. Motorola will allow buyers to go to a website and completely customize the look of their Moto X. At Moto Maker, you can choose from 18 different back colors, two front colors and about a dozen colors for the volume buttons and camera lens rim; you can also choose to emboss a signature on the back of the phone (like you can with the iPod) and choose a wallpaper that ships with your phone. Motorola also announced that, by the end of the year, you will also be able to get a back made of wood. Yes, wood. Real wood. The company claims that this will make it the first wooden smartphone ever. Motorola promises that, because the smartphone is (you may have heard, thanks to an aggressive PR blitz) built in the United States, you’ll have your customized smartphone in your hand 4 days after you order it online. Those are the marquee features; here are the basics for you specs-hounds out there. The Moto X sports a 4.7-inch display with a crisp screen (316 pixels per inch). It ships with 2GB RAM and is available in 16GB or 32GB of storage, with no SD slot; it starts at $199 with a two-year contract. It runs Android and will start at Android 4.2.2; it is not exactly vanilla Android and will have to go through the same update process that plagues other Android manufacturers in terms of receiving timely Android upgrades. Mercifully, however, the Moto X basically does not have a “skin” on top of it, and the bloatware has been kept to a minimum. On my AT&T Moto X, for example, there is only one AT&T app (My AT&T) that comes pre-loaded on the phone. Other specs: Motorola says its phone will get full-day battery life; the rear camera is 10 megapixel with what Motorola calls “Clear Pixel” technology, to capture more light both in daytime and low-light. The front camera is 2 megapixels; it weighs 130 grams; and the phone itself is just a tad larger than the iPhone 5, despite having a 4.7-inch screen (versus 4.0 inches on the iPhone). Almost everything on the device is curved, most notably the back, with Motorola claims has been contoured to fit in the human hand. The Moto X should be available either by the end of August or shortly thereafter, on AT&T, Verizon, T-Mobile, Sprint and U.S. Cellular. Motorola has not announced a formal release date or price, but says suggested retail value is $199 for a 16GB model with a two-year contract. Next: Washington Post Website Hacked!